Smart locks is the latest home automation technology craze that is growing in competition thanks to Bluetooth low energy (AKA Bluetooth Smart) found in many of the latest mobile phones and devices. First there was the popular Lockitron, which slips on the back of your existing dead bolt making setup a breeze, see my previous article, and now there are three new smart locks coming later this year that are expected to bring unique styles and new features. Those brands are named Goji, August and Kevo. Each smart lock pairs with your latest iPhones and Android devices over Bluetooth 4.0. 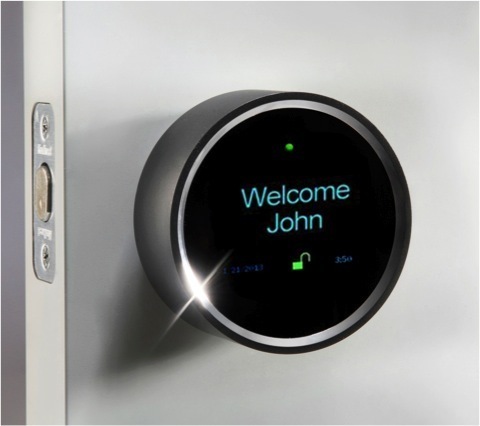 The purpose of the smart lock is to then communicate with your phone to grant you access without using a traditional key to open your door as you approach it. As you pass-through the door and close it behind you, the smart lock will auto-lock for you. Meanwhile, you will still be able to use your traditional keys to unlock your door. It’s important to weigh the pros and cons before making the decision to buy this new type of automation, because the cons could be a bit tricky for you to adapt as I explain below. Detects when your door is unlocked and sends an alert to your mobile device even if a physical key is used. Why is this useful? Lets say you will finally know when your children arrive home from school. Share digital keys with friends and family from anywhere. Why is this useful? You no longer have to be home to lock up behind them or race home to let someone in. Lock or unlock your door remotely should you forget to do so. Why is this useful? If you’re on a business trip or on vacation and you’re worried if you forgot to lock your door. No longer fumble for keys in the dark just to enter your house since it will detect your proximity and unlock automatically for you. Why is this useful? Keys are meant to keep everyone else out, but now you can just walk right in. The auto-lock and unlock mechanism could interfere with your ability to make multiple trips into your house quickly. An example comes to mind would be bringing in groceries from the car. Should you pass by your door, you may not want your door to unlock unintentionally. You may not want your door to unlock unintentionally should you simply want to check who is at your door. Although the auto-unlock feature is optional and can be disabled at any time, rather than take such a drastic action to disable a useful feature, you could simply change your behavior a little bit in support of all this new control. When entering your home with groceries, your phone will be in your pocket to auto unlock your door. Simply leave your phone on your kitchen counter, then physically unlock your door to proceed outside. Should you casually walk passed your door while your phone is in your pocket and your door unlocks, the range at which the auto-unlock feature operates is configurable by the user. I’ve also read there are proprietary techniques with these devices to mitigate false unlocks from the interior side of the door. Should your door bell ring and you want to see who is at your door without alerting them, simply leave your cell phone on the counter that way the door does not unlock unintentionally. To help break down all the smart lock features brand by brand, I tried to create a custom matrix below (scroll left and right to see more information) so you can quickly compare each feature. To learn more about each feature, please see the definitions below the matrix. Note: This list only compares models that support Bluetooth 4.0. Price? Availability? Replaces Existing Dead Bolt? Smart Phone App Activity Alerts/Logs? Works if Wifi Disabled? Built in Camera? Knock Sensor? Smart Phone Remote Unlocking? Proximity Detection to Auto Lock/Auto Unlock? LED Lock Statuses? Minimalistic Design? Multiple Colors? Key Fob compatibility? Physical Backup Key? Share Digital Keys w/ Others? Schedule When Digital Keys Work? Website to Erase Digital Keys? SSL Encrypted? Compatible with BT 4.0? Battery Powered? Battery Life? Battery Life Indicator? Price? How much it’s going to cost to purchase. Availability? When you can order from the vendor’s website. Service fees? Any additional fees to monitor, schedule keys or erase keys. Replaces Existing Dead Bolt? Good to know if you’re renting an apartment and are not allowed to switch out the dead bolts. Smart Phone App Activity Alerts/Logs? Each of the locks comes with a smart phone that logs the time and date each user enters and exits through the door. You’re able to see whether they showed up on time, and how long they actually stayed in your house. Works if Wifi Disabled? If WiFi is unavailable, what features will not work. Built in Camera? Take a photo of guests who activate your lock. Note: A smarter feature would be if the camera would snap a photo within two feet from the lock therefor this feature would function like a remote door peep hole. That way you could see who is at your door even when you’re not home to answer. Knock Sensor? If someone were to knock, you would be alerted. Proximity Detection to Auto-Lock/Unlock? Detects when you leave or enter for it to auto-lock or unlock for you. LED Lock Statuses? The ability to check if your smart lock is locked without opening your phone to check. Minimilistic Design? Bulk/size of the lock system. Multiple Colors? Different color styles. Key Fob Compatibility? Should someone in the house not have a smart phone, for example a small child, the ability to attach a fob to their sets of keys would provide them with access to unlock/lock functionality as if they had a smart phone. Physical Backup Key? The ability to use a traditional key to lock/unlock for backup purposes. Smart Phone Remote Unlocking? If you are not home and want to unlock your door for someone immediately who needs access. Share Digital Keys w/ Others? To grant keyless access to friends, family and visitors by inviting them through the app. Then you can customize what days a person has access to your home, even during what hours, and revoke access whenever needed. Note: Kevo costs $1.99 a key. Schedule When Digital Keys Work? To schedule when your guests should have access and schedule when to revoke access. Website to Erase Digital Keys? The ability to log into a third party site to delete digital keys if your phone is stolen. SSL Encrypted? If the locking mechanism is encrypted. Compatible with BT 4.0? If it will work with your bluetooth 4.0 mobile device. Battery Powered? If it require batteries to power the smart lock. Battery Life? How long will the batteries last before they need to be replaced. I hope you found this article useful, which I plan to update with more accurate and new information as each of the models hit the market. I look forward to hearing your responses in the comments if you’re interested in any of these smart locks. Meanwhile, below are some promotional videos for each of the models. Hi - Thanks for visiting my post! I'm a guest contributor at Phillihp's Tech Blog and I'm avid tech enthusiast about web, mobile or basically anything technology driven. If it's got a computer chip in it, i'll pretty much talk about it. I was recently called an "idea man", hopefully that's a good thing, but as the label suggested, I have a lot of them and I'm always looking for more! Hope to hear from you! This entry was posted in ***, Android, Cloud Computing, Design, DIY, Electronics, Entertainment, Hacking, Hardware, Home Automation, Home Projects, howto, Internet, iPad, iPhone, Mobility, News, User Experience. Bookmark the permalink. I was excited to see someone create a matrix like this! I am looking at purchasing a smart-lock and wanted to understand the differences between all of them. One feature that is key to me is remote unlocking. Item #15 of your matrix should have been “Smart Phone Remote Unlocking?”, but that was missing when I scrolled through your matrix. Thank you for your great work! This has been a great help to me. I decided to purchase the Kevo by Kwikset, because I liked the fact the deadbolt won’t unlock unless I physically touch the lock. The other locks don’t have this function. So when I approach a door, even with my hands full I never want it to unlock unless I take an action, but I just don’t want to fumble for my keys. The only negative I learned is every extra “e key” will require $2. I don’t plan on giving a lot of family access to my house and if they need access, so I could simply unlock it remotely for them. Thanks for this summary, but all of my Mac browsers only show about 3 columns of your comparison table. What gives? Can you repost this in a better format, or perhaps provide a pdf? Mark: InSafari, hover with cursor over the matrix table, then two finger swipe left/right gesture to see the whole table. 1. You appear to be missing the “Service Fees” column. 2. WOT (web of trust) for some reason flags your site as untrustworthy – you might want to investigate and/or comment on that. no magic there but they include Unikey rather than Kevo. 5. You might want to include a column noting if the lock only works with an iPhone or if it also works with Android devices. One thing that’s missing is in the Keyfob Compatibility column. As far as I can tell, only the lowly Lockitron works with NFC as an alternative method of operation. While BT 4.0 is all the rage, NFC has started to get more traction lately, with Google Wallet finally getting more competitors, and gadgets like the NFC Ring (http://www.kickstarter.com/projects/mclear/nfc-ring) starting to come out. And remember, all smartphones these days come with NFC, so if you’re locked out and wifi is down and you don’t have a metal key, you can still use your cellphone to get in. Better than some proprietary keyfob, in my opinion. Sure, Lockitron’s got growing pains, with reports of unreliable operation, but most of that appears to be programming related, which is fairly easy to fix. I’m watching their blogs to see if these problems get cleared up soon. The Goji, by the way, is up to $278, pre-release price. Never heard of Goji until today, and they’re about to start shipping them! I wonder if even more players are about to jump into this arena? 1) visually group/ cluster criteria which have vs don’t have identical values for all rows/ locks. IR night vision The door bell phone support IR night vision. This is especially important if you are handing over one of the paint brushes to your kid. doorbell since it really is different coming from 1 entrance bell about the distinct additional. I think it would be useful to include the rating / assessment of the deadbolt and the mechanical key cylinder for security. I have read that the Kevo barrel is easily tampered and the deadbolt itself has a lower than highest rating. For the August, this all depends upon the deadbolt over which it is installed since it does not come with its own deadbolt / lock assembly but attaches over any other model. I would complement your table adding information on which smartphones are supported by each lock. I do have Android devices, Nexus 4, Nexus 5…maybe soon Nexus 6, I do NOT own any iPhones, with the Kevo, for instance, I am stuck with either iPhone devices or the latest Nexus 6 (which at the moment of writing this I do not own). This is all based on which phones support the Bluetooth Low Energy Technology, and, as you may guess, knowing if your current phone will support or not the specific lock you plan on purchasing is a must. Nice information. Out of curiosity, what do you think about the upcoming Danalock? I saw it Danalock Version 2. Could you please write an article about this product compared to the previous ones?